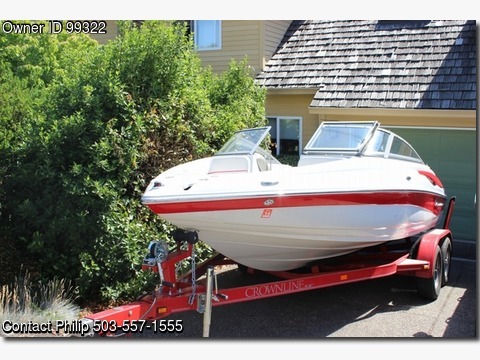 Please call boat owner Philip at 503-557-1555. Boat Location: West Linn, Oregon. 2008 Crownline 19SS ,Excellent Condition, Like New - 74 Hours MERC 5.0 L Alpha, 220 HP, Professionally Maintained Twin Axel Trailer with folding Tongue and Spare Tire Matched Locks Bimini Canvas Cover Custom Snap-on Storage Covers Extra Mooring Storage Cover. Color Moonstone with a Ruby narrow band. Motor MERC 5.0 L Alpha,21 " Prop - GR 1.62, 220 HP Length 19 - 1-8 Adults 27 Gallon Fuel Tank - Weight 3000,- Draft Up 13" - Draft Down 27". Trailer- Twin Axel Trailer/folding Tongue Spare Tire 4 New tires on Trailer. 12 Volt receptacle at helm Anchor storage compartment self bailing Automatic bilge pump w/manual override Canvas - Color-keyed convertible top w/boot. Crystal Cap letters with Crownline Logo. Electric horn, Engine hour meter, Fire extinguisher, Glove box - lockable, drained In-floor lockable ski storage whinged lid. Navigation Lights Rack-and-Pinion steering Windshield - Curved tinted, safety glass with walk-thru Cleats - 6 Stainless Steel 6" pull-up cleats includes mid-ship,embossed Deck Vents - Moonstone Depth Sounder w/Outside Air and Water Temperature.Extended swim platform with fully integrated 4 step boarding ladder w/diamond non-skid Full instrumentation - deluxe fog resistant, reduced glare gauges with Stainless Steel bezels Grab handles - Stainless Steel Interior - Moonstone w/Moonrock accents,Super Sport w/Two newly designed SSS flip-up bucket seats with color-coordinated shield Premium smooth-actuation throttle and shift cables Snap-in cockpit carpet. Stainless Steel Cup holders, Stainless Steel Shocks for Sundeck and Lids, Stainless Steel Ski Tow Rail with Eye Stereo - Sony Marine Stereo w/CD disc player 4 speakers with auxiliary input jack for I-Pod, MP3 player. Reclining Rear Lounge Fold Down Rear Bench Seat Pull out rear seating and walk-thru transom.